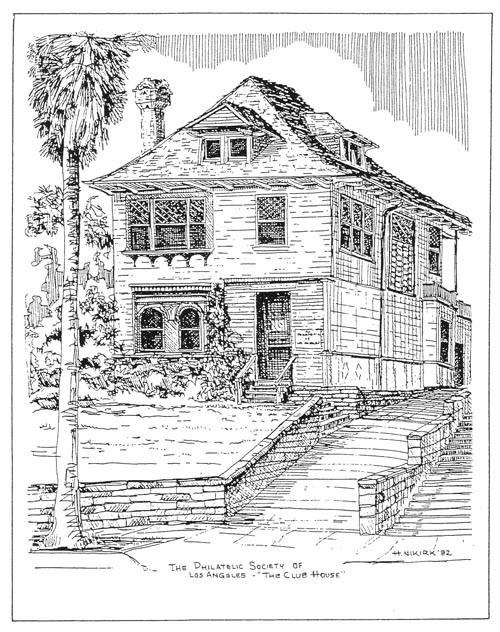 The Philatelic Club of Los Angeles was founded in April 1927 by a group of leading stamp collectors who realized the need in Southern California for a permanent headquarters where local and visiting collectors could meet. The group originally consisted of men only, drawn from varied business and professional backgrounds, and included well-known actors, attorneys, insurance agents, writers, stamp dealers and three Southern California Postmasters. Their goal was a sound and dignified club that would be a credit to the community and a leader among clubs in the nation. The result was a combination Philatelic Society and Social Club. A large clubroom was maintained in the building of the Los Angeles City Club and was available to members at all times. A philatelic reference library was also established during this period. In 1929 the Philatelic Club moved to the Commercial Club at Eleventh Street and Broadway, where a permanent clubroom was maintained on the seventh floor. The first meeting at that location was held on March 4, 1929. Three years later the facility was renamed the Cabrillo Club. The year 1932 was also the year of the Summer Olympic Games in Los Angeles. To take advantage of this attraction, the Philatelic Club invited the American Philatelic Society to hold its convention here and on August 16-19 hosted the “Fourth National Stamp Exhibition” of the APS. In January 1933 there was another change of location name when the Cabrillo Club became the Broadway Club. Then on October 16, 1935, the Philatelic Club added to its already impressive list of achievements by becoming incorporated. After seven years at the Broadway club, the Philatelic Club moved on February 8, 1936 to 2412 W. Seventh Street, overlooking Westlake Park, and a year later to larger quarters next door at 2404. The Club did not prosper there. The Great Depression and declining membership took their toll and in January 1940 the Board of Directors voted not to renew the lease of this facility. At a meeting that July, the Board endorsed a plan to form a Building Corporation whose primary purpose was to lease proper quarters for this Club. On December 1, 1941 they approved a lease with the Philatelic Properties, Inc. for a former residence at 417 Alverado Street. Within a week came Pearl Harbor and the entrance of the United States into the hostilities of World War II. During the war years no annual or Board meetings were held. On February 24, 1947 a special meeting of the Board was convened to accept and ratify all actions of the President and the Secretary during the preceding period. From 1947 to 1971 the Club enjoyed a considerable and active membership, engaging in a variety of philatelic activities including research and philatelic photography. Local chapters of national philatelic organizations were accorded the status of “Units” of the Philatelic Club and were given the privilege of using the Alverado Street clubhouse. The size, organization and use of the Philatelic Library grew significantly during this period. In 1971, the name officially became the Philatelic Society of Los Angeles, Inc. Important revision to its Constitution and By-Laws, including the welcoming of women as members, eventually allowed the granting of tax-exempt status by the IRS. As the number of original shareholders of Philatelic Properties steadily declined, dealing with the growing list of their heirs became too complicated. That, and the mushrooming cost of maintaining the building, particularly aft the February 1971 earthquake, made unavoidable a decision to sell the property. In April 1975 the PSLA moved to the Culver City Public Library under an agreement with Los Angeles County to house the Philatelic Library and furnish a gratis meeting room for the Society. The Quarterly Journal was a photocopied publication that carried both PSLA news and outstanding philatelic articles on a variety of subjects. It served as a forum for the membership, always eager to disseminate specialized research papers, anecdotes, opinions or any item of interest to others. The Journal was accorded high honors by national and international juries. All members were urged to utilize this means of communicating their knowledge to others. A polished manuscript was never required, as the editor was always ready and willing to work with the writer to create an interesting and readable article. November 4, 1935 saw an improbable procession of three camels plodding south along the old road on the crest of what is now Interstate 5 near Lebec, traveling from Fort Tejon to Los Angeles. Over a distance of 80 miles through the Santa Clarity Valley and the Cahuenga Pass (although driven part way by truck, it was rumored), they carried some 7000 pieces of mail to Los Angeles. A library was formed shortly after the founding of the Philatelic Club in April 1927. From the beginning there was an active group of members interested in establishing a substantial reference library. One of the Founder Members, Dr. S. A. “Doc” Kaasen, was responsible for the initial efforts and was soon joined by F. M. Gilbert. We have been very fortunate in having had a number of dedicated members donate their services to the Library since then. Of note in this group were L. H. Scisco, H. M. Calkins and Paul A. Dorn. “Lou” Scisco had formerly been with the Library of Congress, and used his priceless experience to create both a specially tailored call number system and a card catalog of all items in the Philatelic Library. The late Col. Elmer A. Kell, Jr. continued this work in the same dedicated fashion as his predecessors. In 1935 the Club wanted to ensure the Library’s permanence under independent management that would “…perpetuate a philatelic library for educational purposes (and) hold said property for the benefit of Philately.” Rather than form a separate corporation, they established a Trusteeship, and on May 15, 1935, a Declaration of Trust was filed with the County Recorder of Los Angeles to create the Philatelic Library as a legal entity. The Board of Trustees was composed of Earl J. Oakley, President; Walton E. Tinsley, Secretary; A. L. Tobias, Member; Richard S. Willing, Acting Librarian; Carl Shaff II, Member. After the 1975 move from Alverado Street, the books were housed in the Culver City Public Library until 1985, when remodeling of that facility eliminated the philatelic shelf space. The collection was then moved to a non-public area in the Rosemead Public Library basement for the next five year. The basement was twice flooded, once due to a faulty pump; during the same rainy period, an underground stream that had once been diverted to make way for the basement sought its old path and added to the puddle. Only slight damage was done to the books, but eviction again resulted. For several years, negotiations had been under way to house the books in the Beverly Hills City Library, and in August 1990, agreement seemed certain enough, especially in view of the Rosemead plight, to move there. Alas, this was not meant to be; by January 1993 the Beverly Hills Library changed direction and yet a further move became necessary, this time to a Public Storage space in Van Nuys. Eventually the Directors voted to dissolve the library and the books were dispersed.